Less is more in the August heat. 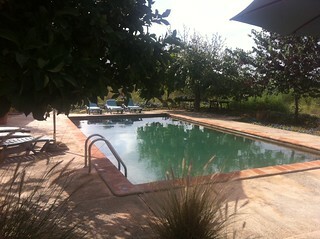 Join us for a relaxing yoga holiday-retreat. 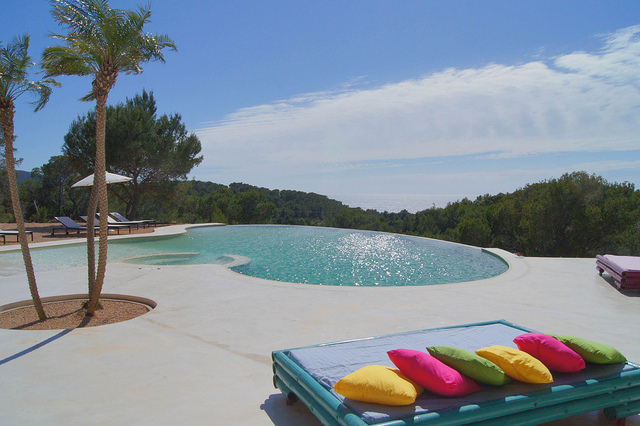 For yogis of all levels, this gently hosted retreat offers an A-Z of complementary therapies and pool-side pampering, Ibiza Retreats Mind-body-spirit concierge service so that you can know-where-you-are-going to explore the most beautiful…. and still quiet! parts of our magical white island. Contact us for details of accommodation and to book… places flying fast! Casa Corazon is a private Finca retreat, full of soul and surrounded by countryside, with fruit trees full of lemons and figs scenting your siestas by the pool. Hosted by Valerie, whose wisdom and lightness of spirit sustain a light and nurturing vibration in this enclave of bohemian bliss. Magical details and shanti-shanti harmony make this the perfect place to relax, practice yoga, sleep, read, receive treatments & therapies underneath the fig trees. Valerie offers a wonderful meditation within the program – more on request. Guiding you to connect with your source of em-powerment within. Faye, a superb bodyworker and energy healer will massage aches, pains and tensions away and supports Valerie and they offer the most amazing organic brunches, created with love and served with a smile. Just 2 mins by car or 20 mins walk from the gently humming village of Santa Gertrudis where divine dinners can be enjoyed in the many amazing restaurants here. Your closest beach…. beautiful Benirras. Where the mystical rock and the sunsets draw lovers of life from all over the world, culminating in the Sunday drumming sessions – the famous drums of peace. Enjoy a juice at the SeJuiced bar, shop for divine boho-chic dresses or simply watch the hippy-feel beach lovers from all over the world chillaxing. 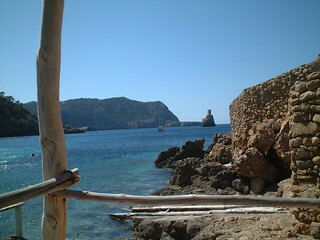 We also offer further optional beach trips to the turquoise waters of Cala Xarraca and S’Illot towards Portinax in the North. Morning tea and light fruit if you wish. Optional evening meditations, sunset hike & cliff-top meditation. 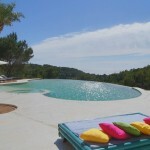 * Ibiza Retreats Mind Body Spirit Concierge service to help your stay be as relaxing as possible…. and to….ensure you can enjoy the quietest and most tranquil parts of our beautiful island during this hot hot hot time of year. Susie is a dedicated ‘yoga-for-life teacher’s. She teaches a “go with your flow” fusion of Vinyasa, Hatha and Restorative yoga to help you tune back in to your body’s infinite wisdom. We support you to rebalance in body and mind, to open your heart and to develop confidence in your practice to listen to your internal rhythm, creating a healthy spine, a calmer mind and connecting you with your core strength within. 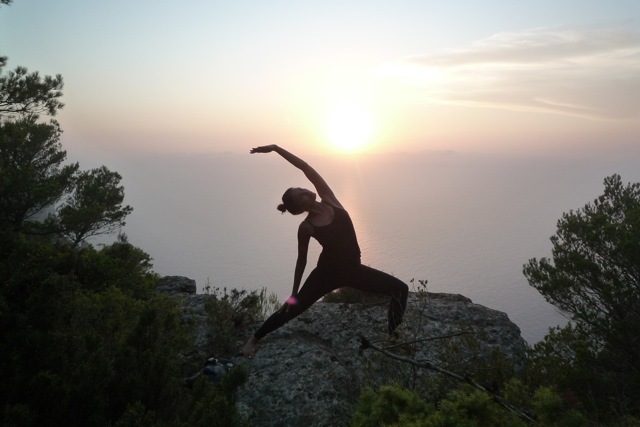 Larah teaches “Go with your Flow” yoga from the heart, offering pearls of energy-enhancing – and rebalancing wisdom and popping in morsels of yoga philosophy. Her focus is to help you feel your body – and your yoga – through your practice. To feel comfortable in your being and find a new passion for strengthening and empowering yourself from within. The Essence of the Yoga: We place a firm emphasis on “less in more”, with breathwork and transformative visualisations, self-healing techniques to take away and meditations embedded within the practice. 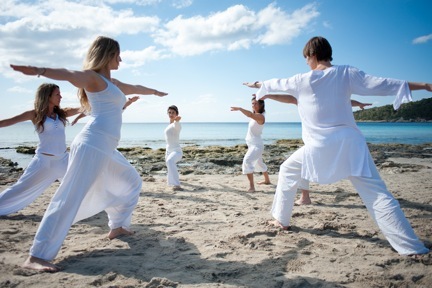 Mind Body Spirit Concierge Service – to help you tailor-make your time in Ibiza, enjoy our expert guidance to go with your flow, day by day, explore hippy markets and seek out the finest sunsets, explore quieter beaches in the high season and enjoy an A La Carte menu of treatments & therapies. Adho Mukha Svanasana – Downward dog is the leader of the pack!